To increase sales and conversions, it is eminent for online businesses to make it as easy as possible for the customers to pay. This is why, the checkout page is the most crucial, and it must be as simple and convenient as possible for a customer to make payment through the same. A checkout page is the final stop for an individual shopping on a website. It is here where a person provides important details, such as credit card information, email address, shipping address etc, to proceed with the payment. Thus, it is evident to secure the payment and checkout page with necessary technology and drive the attention of the user to the payment process to wrap up the sales cycle without leaving a room for any disruption. 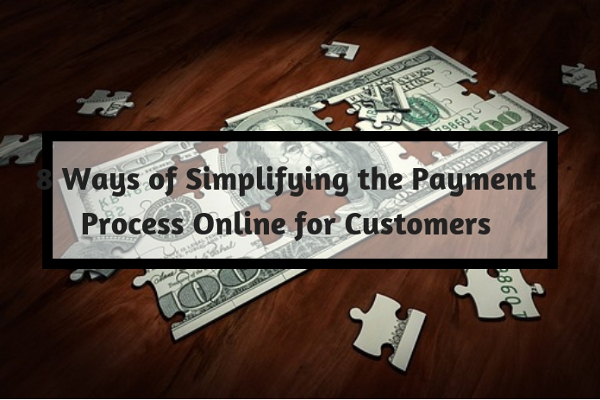 To make the payment process a piece of cake for users online, below, we have provided 8 mind-blowing tips. Keeping a track of username and password for all possible websites is a tedious task. Thus, the requirement of having a customer register for an account before making a payment should be eliminated. Many people forfeit the payment process when asked to login or to create an account, because they may think that the website is asking for too much information. Especially for a first-time customer, signing up for an account just to complete the payment is a major setback. The person may dislike the very idea of signing up on the website to purchase a product/service. It may seem as the business-provider is lengthening of the payment process. In an instance where you wish the user to sign-up for an account, you may ask for the same before the order is placed than on the checkout page. Users should be able to complete the payment procedure as a guest than having to login to their account or creating a new login ID. While it is not necessary to offer more than one payment method, many websites today offer multiple payment methods, keeping in mind the ‘ease of payment’ for customers. Multiple payment options allow users to use a payment option, which is most feasible for them. For instance, what if the payment method you offer is not the one that the user uses? In that case, you may lose the customer. This is why, it is always better to have payment options such as that via credit cards, debit cards; net banking, payment wallets, coupons, etc. The checkout page must list out the payment options clearly, so that the customer can choose the one he/she wants and complete the payment promptly. On your website, you can also dedicate a knowledgebase section, which provides information about credit cards and how EMIs work, online banking, benefits of specific payment applications/wallets etc. In order to know more about what is needed for internet banking service, you may request the customer to visit their bank’s official website. Redirecting people away from the website to another for payment may make customers ending up feeling as if they are providing money to an another business, than the one from which they are purchasing from. It is best to integrate the payment section on a page. Even if the checkout page redirects to another payment gateway page, be sure to inform the user than all their payment and crucial details will be secured and not shared with unconcerned third-party. While providing details to complete a payment, sometimes users may make errors such as missing out on ‘@’ when typing out an email address, or leaving a mandatory field blank, and other such minor errors. Thus, prompt the user with a relevant error message at the field where the error results. Another tip is to save the data or information the user tries to submit, as it is inconvenient to have a person resubmit a form or provide details all over again, just because he/she has made a silly mistake in filling out the payment details. When a customer is making the payment, it is the final step to end the sales cycle. Thus, the checkout page must be clean and precise to its intention, which is to close the sale and providing no distractions in the process. You must not put up any advertisements or unnecessary navigations on the checkout/payment page. Ask for bare minimum details to customers, only the ones required to fulfil the payment. Keep the checkout page in line with the brand elements such as colours, fonts, and designs so that you can create brand recognition among the customers. A consistent and seamless design throughout the website will make users stay focused and do away with doubts of online scams or any scepticism regarding online payments. In fact, the design pertinent to a brand must be consistent across all channels, and not just the payment page. Be precise about what you want the customers to do. For instance, when a user adds a product to the shopping cart, you can prompt him/her with a message, as to what to do next- either to continue to the checkout page, or to continue shopping rather than giving vague options such as ‘checkout’ or ‘continue’. A clear call to action will bring a better conversion rate. After the payment is successful, congratulate the customers on placing the order and provide additional details, which instil their trust in the brand. For instance, you can tell the customer that they are the 100th customer of the day and to keep shopping with the website to earn loyalty points or additional benefits. You can bring in another call to action here, asking them to subscribe for additional services, such as emailers for discounts and new offers, or offering them a free coupon for future purchases on their email address. The above-given tips will surely help you in making the checkout session more comprehensive for customers. Do try these out in making your business successful in terms of generating higher conversions and sales.